Max Planck, Born in Kiel, where I once lived (and I never realised). Did great work on black body radiation, one of the most fascinating areas of physics. Steve Keen today quotes a fabulous phrase from the great physicist, Max Planck. The last tricky piece of the puzzle about sleep, for me, is the difference between a traditional model of how the body works, and the tensegrity model. In the traditional model you have activity and effort, and then you 'relax' to recover from that activity and effort. Activity and effort involve exertion and 'doing' things, and relaxation is a sort of collapsing and doing-nothing. In the tensegrity model, which is how our body works (it just hasn't flowed through into the common biology teaching yet), there is no distinction like that. Both activity and what looks like non-activity e.g. sitting or lying down, involve exactly the same mechanisms. You don't have to exert yourself to do things, like walk or run or lift something, because your whole body is elastically pre-sprung to release into those sorts of things, you just need to let it. I've been very slack with blog postings lately. It's been all go at work, so not much spare time. But then this blog is really like a diary of ideas for me, so I don't try to meet any sort of publication schedule. I'd still write it if nobody read it, but thanks to those who do! Sleep. I've had a difficult relationship with sleep for a lot of years. Good sleep can make the difference between a good or bad day, and I've noticed the quality of a day is profoundly affected by the quality of sleep you've had. My basic difficulty with sleep is that I get to sleep fine most nights, but then wake about 3am and struggle to fall asleep again. It's one of the classic types of insomnia. I get from 5-6 hours of sleep most nights. Proust explored society and love and many other things all with a wider project in mind. This project was the exploration of the nature of time. Philosophically understanding time and space is understanding everything, really. It wouldn't be if you think of them in the usual ways, like shoebox containers that everything sits inside. But that's another topic. Having rescued my main guitar from the cellar a few months ago, after 5 or so years of hardly playing it at all, it's been amazing for me to see how quickly it all comes back. The fingers know where to go. I used to play a lot, having started at about age 15 and then playing off and on for about 20 years after that. Never hours and hours a day, just here and there when I felt like it and had time. When you learn an instrument it can be difficult to know how to go about it. Often you'll have a teacher who has their own particular views and methods. I did that for more than 10 years with piano, turning up once a week to be whacked with a ruler for bad hand position and for not having practiced. (No complaints from me, I much preferred that direct "that's crap" approach to being mollycoddled.) The scales and other 'exercises' were always boring though. Much more fun to learn the pieces or songs. To explain the slowing of posts on here. I've had a lot on, and am now a bit ill too. The posts will keep coming, just with bigger gaps between them for a while at least. You Always Hurt the One You Love. Jealousy and Proust. 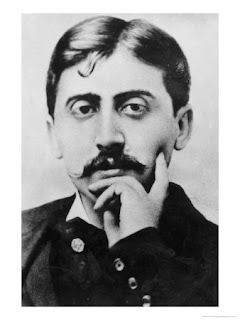 Marcel Proust, whose search for 'lost time' has been called the greatest novel ever written. It's definitely one of the longest ever written (6 volumes), but is entertaining and not too difficult to read, provided you don't mind occasional sentences that stretch to over a page. Proust's views on love are fascinating. For Proust an essential part of love is jealousy. (You need to cast aside pre-conceived ideas about love and jealousy to really appreciate what Proust is saying, even if you don't agree with him.) Jealousy is important for Proust because it points to the very nature of love that Proust believed people most often misunderstand.